The Diocese of Shrewsbury was formed from the six northern counties of Wales along with Cheshire and Shropshire in 1851 following the Restoration of the Hierarchy a year earlier. The Welsh part of the diocese broke away in 1895 but it has still left its mark, with St Winefride, the Welsh virgin and martyr, revered as the secondary patron. The Welsh connection also meant that the first Bishop of Shrewsbury, the Rt Rev. James Brown, ordained the celebrated poet Gerald Manley Hopkins in 1877 in the same Jesuit house of St Bueno’s, where the Rt Rev. Edmund Knight, the second Bishop, also ordained George Tyrrell, theologian and bête noir, in 1891. Bishop Brown was himself buried Pantasaph, Wales, after three decades in office in which he oversaw a trebling in the numbers of priests and more than a twofold increase in the number of churches, and the proliferation of schools for the poor and of communities of women religious. A prominent benefactor of the Church at the time of the restoration of the Hierarchy was the Earl of Shrewsbury who intended to build a cathedral in Shrewsbury on the appointment of the first Bishop. He generously offered to build a church in Birkenhead, which was a centre for the Catholic population, and an application was made to Rome to change the name of the diocese from Shrewsbury to Birkenhead but it was refused. So the Cathedral Church of Our Lady Help of Christians and St Peter Alcantara in Shrewsbury was completed in 1856, in an area of the diocese where the faith had almost become extinguished, but for a few stalwart recusant families: Irish Catholic migrants, so numerous in the north of the diocese, seldom ventured into its rural south. The oldest recusant families were the Blounts of Mawley Hall and the Plowdens of Plowden. One of the Plowden family had been asked to become Chancellor by Queen Elizabeth I, but refused. His memory is kept alive by the Newman Association, who have a Plowden group for lawyers. Acton Burnell came into Catholic hands in 1660 and the Smythe family, who had inherited it, gave asylum to the Benedictines and their schools expelled from France during the Revolution. After a number of years these moved to Ampleforth and Downside, where they remain present today. Other distinguished Catholic Shropshire families included the Actons of Aldenham Hall. It was there that Lord Acton wrote much of his great history, and also Ronald Knox, who had been chaplain at Shrewsbury School, returned to his translation of the Bible. The chaplain to the Acton family was John Kirk, whose drawings of the English Martyrs from the Chapel in Rome, destroyed by the French, were the basis of the present reproduction in the Venerable English College in Rome today. Following the frenzy of Elizabeth persecution, that claimed the lives of eight Shrewsbury martyrs, the faith in Cheshire had also all but died out, with a very small number of families remaining steadfast in the face of crushing anti-Catholic penal laws. Those who weathered the storm included the Pooles of Pool Hall, the Stanleys of Hooton and the Masseys of Puddington, some of whom endured additional suffering during the hysteria stirred up by the fictional plot Titus Oates in the late 17th century. It was at the home of William Massey at Puddington Hall that St John Plessington served as chaplain until he was arrested and charged with high treason because of his priesthood, dying as a martyr in Chester in 1679. The Catholic population of Cheshire began to grow significantly towards the end of the 18th century, however, as Irish immigration began, initially to work on the farms of Cheshire, and then to work on the development of the canal system, followed by the railways. The Great Famine saw large numbers of Irish fleeing to England and settling in the northern towns of the diocese. In the late 19th century it was estimated that a third of the Irish born in England were in the twin towns of Birkenhead and Liverpool. The influx sparked off anti-Catholic riots in both Birkenhead and Stockport but the Church continued to grow, with numbers boosted further by Catholics moving into the diocese from the Lancashire cities. Most notably, a boom in the spread of new residential areas during the 20th century saw Wythenshawe, south of Manchester, become the largest overspill estate in Europe. The area had already been chosen as the site for the development of Manchester Airport, which is now the largest provincial airport in the country. The new towns of Runcorn and Telford followed. Following the 1944 Education Act there was increase in the number of Catholics schools in the diocese, thanks largely to the vision of Bishop John Murphy, who also opened 30 new churches in just 10 years. His successor, Bishop Eric Grasar, saw the number of diocesan priests reach a maximum of 211 in 1975. But within about 30 years that number had fallen by about half. Yet, when Bishop Brown began his work he had the help of 33 priests serving a Catholic population of some 20,000 people. There are now 10 times that number of Catholics and their numbers continue to increase thanks mainly to the immigration of large numbers of Indians, Filipinos and Poles. 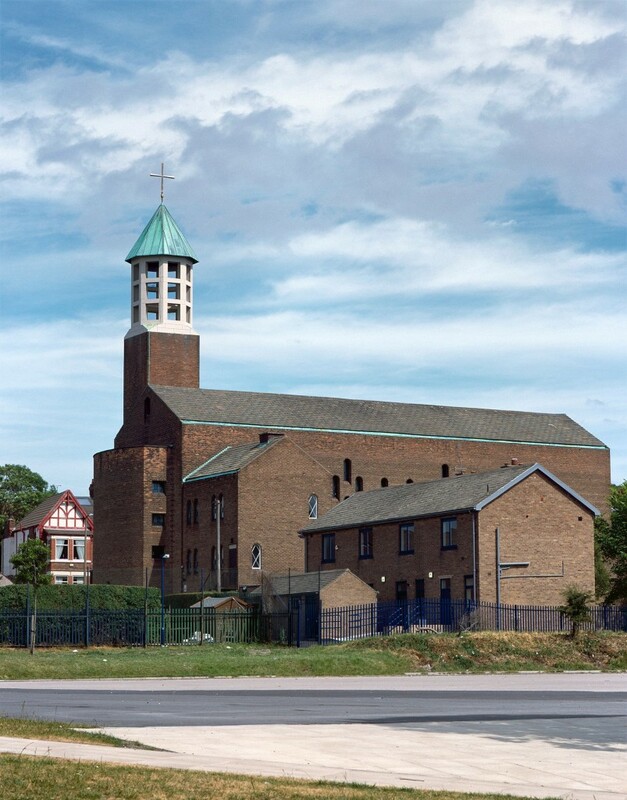 Photo of English Martyrs’ Church, Wallasey, courtesy of Alex Ramsay.